WEST WINDSOR – New students, current students at Mercer County Community College (MCCC) and visiting students home on summer break will have an opportunity to catch up or get ahead by earning college credits during the Summer session at MCCC, which is now open for registration. Students can choose from a variety of general education courses, including English, mathematics, communications, history, psychology, and foreign languages. On-site classes are available in abbreviated sessions – many lasting six weeks or less – or students can study at home or on the go through MercerOnline. The start dates for most Summer session classes are May 26 and July 8. 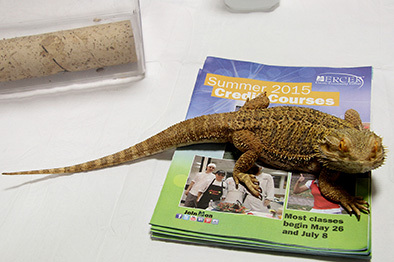 Gary, a bearded lizard and mascot of the MCCC Math-Science Building, is ready to greet students to Summer Session, with most classes beginning May 26 and July 8. Payscale, Inc., an online salary, benefits, and compensation company, recently ranked MCCC graduates first in New Jersey and seventh in the nation in earning potential among degree-granting two-year colleges. The full report is available at www.payscale.com.